The Radio Revival Heart to Heart Hour with Rev Charles Fuller. Charles E. Fuller was born in Los Angeles, CA, in 1887. From 1912 to 1918 he was occupied raising oranges, and served as the manager of the Southern California Citrus Packing Association. After holding several leadership positions in the Placentia, California, Presbyterian Church, Fuller attended the Bible Institute of Los Angeles (now BIOLA University.) However he left the college to teach a Bible class at the Placentia Presbyterian Church, a class that was so popular it out grew the church and had to be held in the town hall. Fuller was ordained a Baptist Minister in 1925 following a break with the Presbyterian Church. A new church, Calvary, was organized by members of his Bible class. In 1927 Fuller was in Indianapolis for a Bible conference. Here he was invited to fill in for the regular speaker on a Gospel Radio show. The concept of being able to reach so many lost souls through the microphone entranced him. Three nights later a message from God awoke him, assuring him that soon there would be radios in every home in America. In 1933 Fuller resigned from the church to dedicate himself full time to his work in radio. In California he began with a Sunday morning and evening broadcast on KGER. The morning show was The Pilgrim Hour and the evening show was The Old Fashioned Revival Hour. By August of 1933 he added programs on Los Angeles stations KFI and KNX. 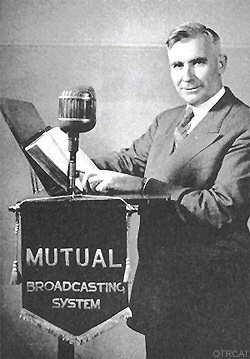 In 1937 he joined the Mutual network, and soon was heard coast to coast. Charles Fuller went home to his Lord in 1968, shortly after his last radio broadcast. Be the first to comment on "Radio Revival Heart to Heart Hour"